British Columbia is developing a new transportation plan. 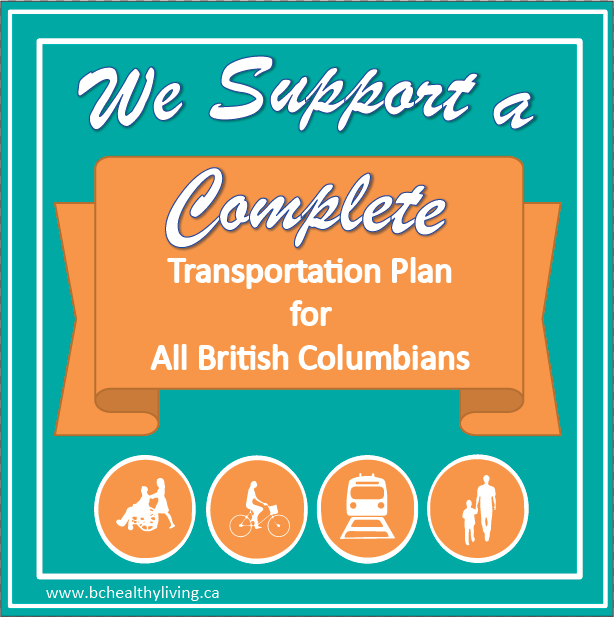 This plan will affect the transportation choices available to British Columbians and the shape of our communities, towns and cities for generations to come. Time is running out to weigh in on the plan. Find out more and then take action now! We are asking the government to bring forward a plan that puts people first. A complete transportation plan is one that is designed for all ages, abilities, and modes of travel. It should be safe and comfortable for people walking, cycling, riding transit or using wheelchairs. This should not be an afterthought, but an integral feature to the plan and of all the roads and bridges in BC. Provides safe and healthy mobility options for people as well as goods. Is cost-effective and fosters economic growth. Get the facts here. For more detail on cycling visit the BC Cycling Coalition. Use our sample letter or use your own words for added impact.